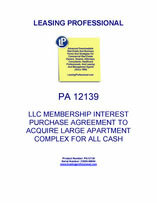 This agreement contemplates an all cash sale in a transaction where the buyer acquires all of the LLC membership interests in the LLC that holds title to a large apartment property. The acquired property consists of a large apartment home development with related amenities and recreational facilities occupied by hundreds of residential tenants under individual leases. The agreement contains comprehensive covenants and representations and warranties. The agreement provides for an inspection period allowing the buyer to inspect the physical condition of the property as well as its title and other attributes. The incentives to structure the acquisition of real estate this way may include (depending upon the jurisdiction involved) the avoidance of having to purchase expensive documentary stamps for the transfer of the deed. The parties may also have been seeking to avoid having to pay expensive transfer taxes. Normal Elements of a Real Estate Purchase Agreement Are Included, Such as Those Dealing With Proration of Taxes, Rentals, and Utilities, and Fees Under Service Contracts, Tenant Deposits, Commissions, Etc. THIS CONTRACT OF PURCHASE AND SALE (this "Contract") is made as of the __ day of __________, 20__, by and between COMMERCIAL PROPERTY OWNER, LLC, a limited liability company, ("Seller"), and COMMERCIAL PROPERTY PURCHASER, a ___________ corporation ("Buyer"). 1. Seller is the owner of all of the membership interests in ________________ LLC, a __________ limited liability company (the "Company"), including, without limitation, all of Seller's right, title and interest in and to the capital, profits and losses of the Company and its assets, property, rights, and privileges, both real, personal and mixed, tangible and intangible, of every kind and character whatsoever, including, without limitation, all monies and distributions of property now due or to become due (herein referred to collectively as the "Membership Interests"). 2. The assets of the Company include the "Property" (as hereinafter defined) located at _______________, ____________________, consisting of a ____ unit apartment complex and related facilities more commonly known as the _______________ Apartments. 3. Seller desires to sell to Buyer, and Buyer desires to purchase from Seller, on the terms and conditions hereinafter set forth, the Membership Interests of Seller, including, without limitation, Seller's interest, through the Company, in the Property, it being the intent of Seller to transfer unto the Buyer all of Seller's right, title and interest in and to the Company, its capital, profits, losses and distributions and all the Company’s real and personal property and assets of every type and description whatsoever and wherever located. (G) All leases and occupancy Contracts for all or any part of the Land and/or Improvements and all amendments thereto, all as described in Exhibit "D" attached hereto and incorporated herein by reference, together with those leases, occupancy Contracts, and amendments thereto which may be entered into after the date hereof as provided herein (each, individually, a "Lease," and all collectively referred to as the "Leases"), and all security deposits, pet deposits and other deposits owned by the Company in connection therewith (collectively, the "Security Deposits"). The Company’s right, title and interest in and to the Land, the Improvements, the Easements, the Tangible Personal Property, the Other Assets, the Contracts, the Leases and the Security Deposits are collectively referred to herein as the "Property". Subject to the adjustments hereinafter set forth, the purchase price (the "Purchase Price") to be paid to Seller by Buyer for the Membership Interests shall be ________________ Dollars ($___________) (the "Purchase Price"). Seller and Buyer acknowledge and agree that the Purchase Price was determined by the fair market value of the Property established by an independent appraisal of the Property (the "Appraisal") commissioned by Buyer and conducted by _________ (the "Appraiser"). Seller acknowledges and agrees that the Company shall be solely responsible for the payment of any pre-payment penalty under the existing indebtedness (the "Existing Indebtedness") of ________________ ("Lender") encumbering the Property, and such pre-payment penalty shall be deducted from the Purchase Price and paid to Lender as a disbursement on behalf of Seller at Closing. The Purchase Price shall be payable, by the wire transfer of immediately available U.S. Federal Funds at Closing through the Title Company to an account designated in writing by Seller. Seller and Buyer covenant and agree that their agreement to sell and purchase the Membership Interests, respectively, together with Seller's and Buyer’s other covenants contained herein, including, without limitation, Seller's covenants in Section 7 herein and Buyer’s out-of-pocket expenses to be paid (i) to Buyer’s attorneys in connection with the negotiation of this Contract and matters related thereto, (ii) to any prospective lender as an application or commitment fee, (iii) to ____________ for the Appraisal, and (iv) to unrelated and unaffiliated third party consultants in connection with the performance of examinations, inspections and/or investigations pursuant to this Contract, constitutes good and valuable consideration and mutuality under this Contract. Provided all conditions precedent to Seller's and Buyer’s respective obligations under this Contract have been satisfied or waived in writing by the party entitled to the benefit thereof, the consummation of the transaction contemplated hereby (the "Closing") shall take place in escrow through the Title Company (as hereinafter defined) on the date which is thirty (30) days after the expiration of the Inspection Period (as hereinafter defined) (the day of Closing is herein referred to as the "Closing Date"); provided, however, in no event shall the Closing Date extend beyond __________, 20__.